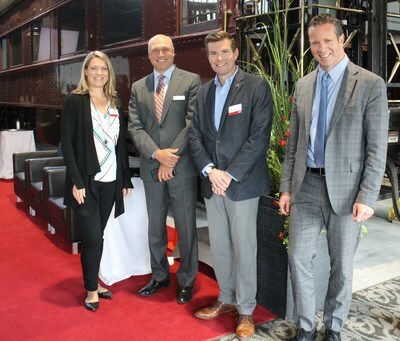 CALGARY, Sept. 10, 2018 /CNW/ - Canadian Pacific Railway Limited (TSX: CP) (NYSE: CP) and its short line and regional railroad connections met over the last two days to discuss shared opportunities for moving the North American supply chain forward, as part of CP Reconnect 2018 Short Line and Regional Railroad Conference. "Our short line and regional connections are integral to the business we do here at CP," said John Brooks, CP's Senior Vice-President and Chief Marketing Officer. "Reconnect 2018 was an excellent opportunity to touch base with these key stakeholders and help them understand CP's vision, while also getting a better look into their own priorities and business goals. By sharing ideas and strategies we are able to generate innovative ways to serve new and existing markets together." Brooks was joined by his senior team of Joan Hardy, Vice-President Sales and Marketing, Grain and Fertilizers; Jonathan Wahba, Vice-President Sales and Marketing, Intermodal and Automotive; and Coby Bullard, Vice-President Sales and Marketing, Merchandise and Energy, Chemicals and Plastics. They interacted with 39 short line and regional connections from across North America who attended. Short line and regional connections contribute over 10 percent of CP's annual carloads and 14 percent of CP's annual revenue across its network. "It's essential for short lines like Iowa Northern Railroad to meet with Class 1 railroads to maintain a great working relationship. It benefits both networks," said Dan Sabin, President of the Iowa Northern Railroad. "Thanks to this conference we were able to gain a better understanding of CP's vision for its business, how we fit strategically into that plan and how we can help enhance the service we provide together. This helps keep our operations running smoothly and effectively." Attendees shared ideas that will allow CP and its new and existing customers to work on joint operations more efficiently while creating a better product for shared customers. Success stories such as the intermodal service to Jeffersonville, Ohio that CP now offers with Genesee & Wyoming Inc. served as inspiration for many of the conversations over the two days. "We look forward to on-going collaboration as we put more strategic dots on the map and find win-win opportunities that move the transportation supply chain forward and help drive sustainable, profitable growth," said Brooks.